I have talked about Winzip, Winace and 7 Zip in my previous post about what they offer to a end user and their plus and minuses. Each one has got its own advantages and different set of people like one product or the other. Today i will be talking about something same and something different. Confused ?. Same in the sense that the stuff i am going to talk about does the same thing i.e. unzip or uncompress but different in the way it does. I am talking about a online utility Wobzip which does the stuff of unzipping files for you. 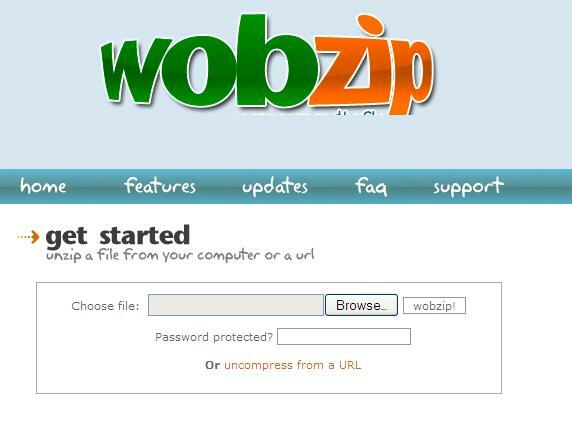 WobZIP is a free online tool that allows you to uncompress your files online. Now you can unzip your files in school, at work or anywhere as long as you have access to the Internet. No longer will you be limited by the inability to install programs onto admin-protected computers. It scans your compressed files using an anti-virus scanner Bitdefender so any infected files will be removed before you download them onto your computer. It allow users to uncompress as many compressed file formats as possible. This means that you can compress your files using the compression format of your choice and send it to your friends.